The 52nd Annual Woodlawn Needlework Exhibit was just as fantastic as previous years. It was great to see Patrick B (170 & 171) from my ANG Main Line chapter submit his realistic looking giraffe & 3 dimensional frog. Also in the animal room, Mary W (616) stitched Tanya Berlin’s Bluebird on 200 count – amazing that it only got 3rd place! Outstanding senior entry went to Marlene L (585) for an eagle done in cross stitch in 28-count ligano. Another 100+ year old, Florence N (424), got 2nd place for a large, beautiful paisley rug (hung above a door which I missed during my first walk around). I enjoy seeing famous works of art stitched & Lauren B (121) did the “The Kiss” by Gustav Klimt in cross stitch. 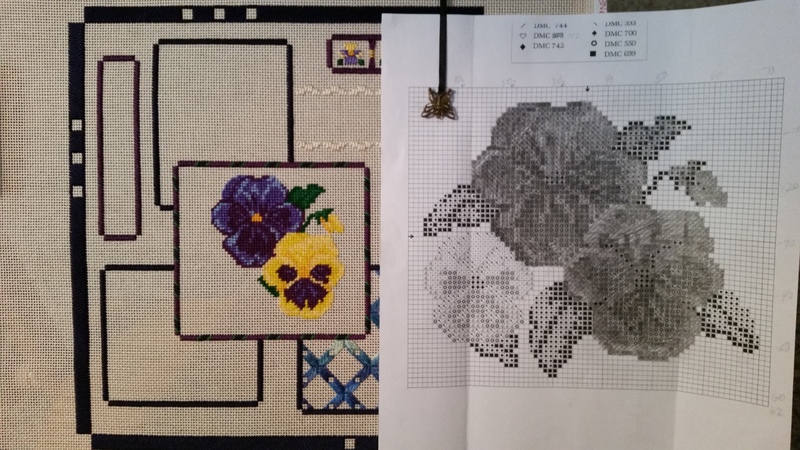 Sherri B (250) cross stitched a row of stems & leaves featuring flowers for buttons with butterfly buttons flying above. Pat G (303) stitched a working clock with buttons at each number around the face. These reminded me that I started a button collection with intensions of doing something like these (but have yet to get to). Jean Hilton stitches always are fascinating to see in a design. Kurdy B (19) did a wonderful copper piece. 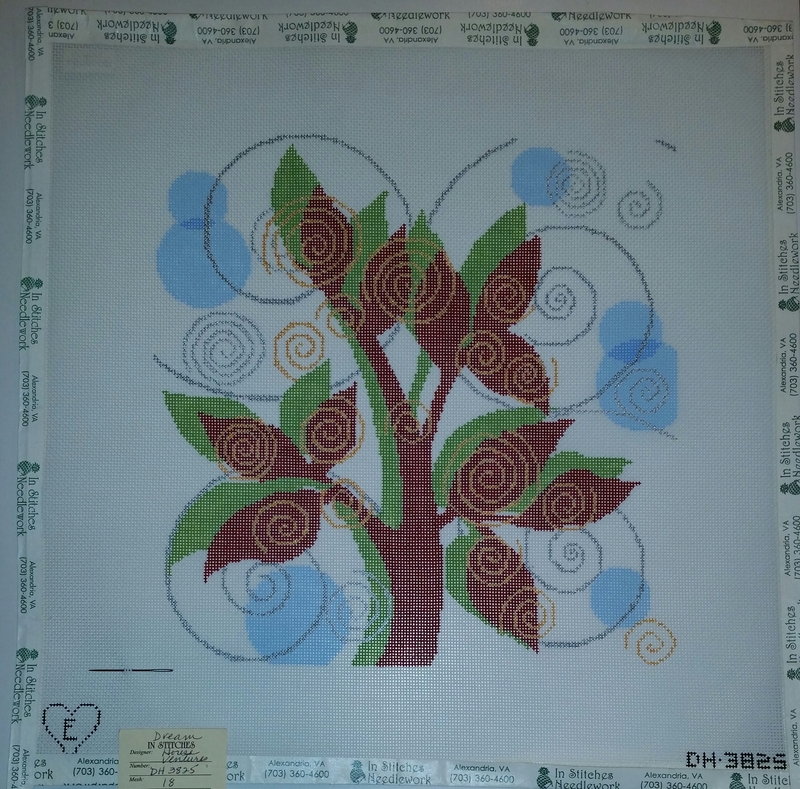 Deborah L (562) did a Ro Pace design, Venetian Delight, as a single layer piece although it was designed to be done in 3 layers – hers was still beautiful. I love seeing Janet Zickler Casey’s Santa ornaments & Jill B (130) did one of my favorites, the Christmas Light Santa. And, there was an adorable pumpkin done by Radonda R (100) in multi-canvaswork stitches (either triangle or square shapes) with the eyes, nose, and mouth done in dark greys against the bright orange pumpkin. It’s always nice to see Nancy Cucci’s pieces and Dorothy B (227) did one but now I can’t remember which one. I have a partially started piece of Nancy’s in my stash & on my list to finish this year. Still have ¾ of a year left! What a sight to see – the 11 Michael Boren “Frankie” pieces (in various colorways) were done mostly by New Jersey Needle Artists (all but one). Two of the ladies Rosie L & Linda M did 2 different colorways! Fantastic!! Brenda C (641) got 1st place for her black & white ort box which I saw first at the Nancy Cucci class I took with her chapter in Delaware a few years ago. She also got 2nd place for Rose Swirls by Carol Algie Higginbotham and 3rd place for Beach Walk by Linda Reinmiller – both new ANG Correspondence Courses. 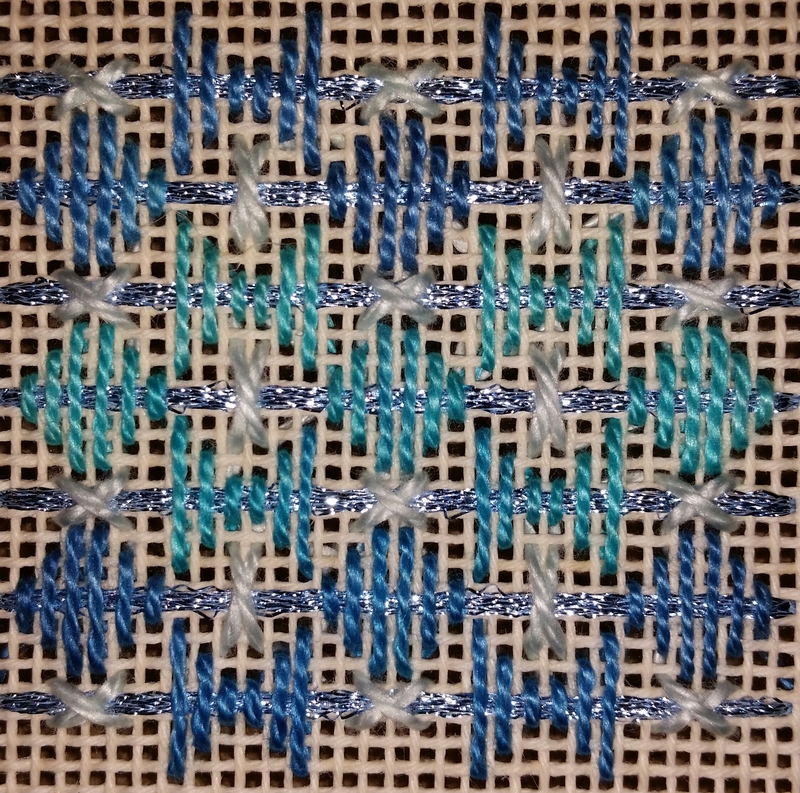 I am quite sure Donna LaB (208) replaced some of the threads in Rachel Atkinson’s Gordian Knot (a returning ANG CC) with Kreinik to add some sparkle. Cheryl H (619) did a beautiful Stained Glass Sampler also designed by Carol Algie Higginbotham which was a previous ANG CC. Christin L (520 & 521) got 2nd and 3rd place for very cute boy and girl pilgrims, respectively. 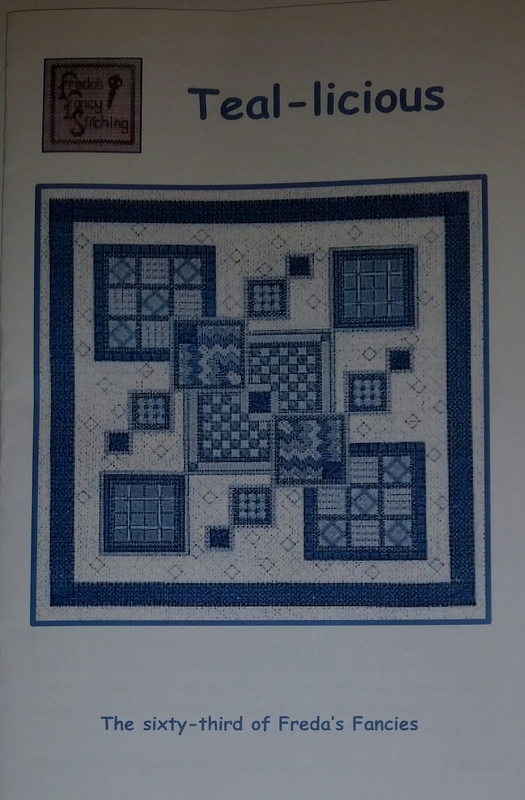 She also did the Debbie Stiehler’s 2013 ANG Stitch of the Month. Christin had it finished very creatively in a diamond shape with beads dangling from the loser 2 sides and it was inserted on a stick in a potted plant. Sara Leigh M (231) stitched the Orna Willis piece Color Inspirations – I am so excited about doing this class on June 12 & 13, 2015! There are still openings for this 2-day class in Philly – just ask for details. It was fascinating to see Susan C (567) and Carol S (20) stitch Walking the Water’s Edge by Diane Herrmann slightly differently from each other. Carol stitched less water & more foam. 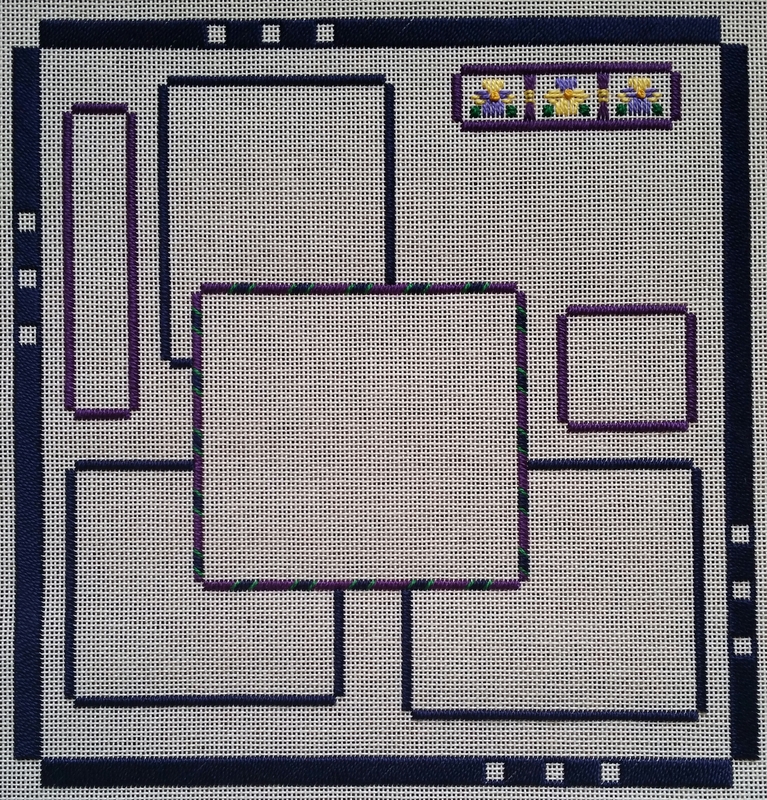 And, Carol’s piece was surrounded by a narrow red mat, a wider blue mat, and then a third textured beige mat. The frame was a light wood (fantastic matting, only I would prefer a darker wood frame). I’m so excited about doing this class on October 10, 2015. There are still openings for this 1-day class one hour north of Philly near Peddler’s Village – just ask for details. Rachel C (361 & 362) stitched Mindy canvases although I liked the one that didn’t win 1st place better. I saw other Mindy canvases by Marla F (421) and two from Maureen McA (322 & 323). But, I don’t know them by name nor can I remember them enough to search & name each design. There were a few Charlie Harper designs including one from Rachel C (363) of birds sitting on a large upside down fanned out leaf called Put a Bird on It. And, one with a menagerie of animals but I forgot to note who stitched this large piece. And, seeing Melanie D (556) stitch Pieces of Eight by Gail Bicknell means this remains a classic as it is still being stitched. It was originally in Needlepoint Now in 4 installments (Sep/Oct 1999; Jan/Feb 2000; Mar/Apr 2000; May/Jun 2000; Jul/Aug 2000) but is still available as a single reprint. 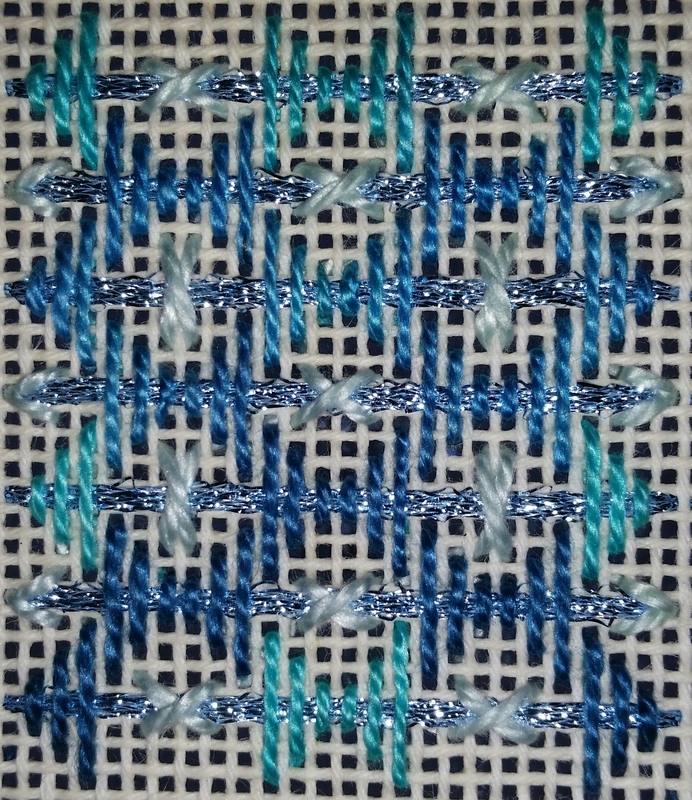 There was a striking piece of smocking done on a box top by Barbara M (727). And, Betsy M (233) had a castle scene done in embroidery and stumpwork which earned her 1st place and Judge’s Choice award. Among Catherine Jordan’s always lovely pieces was The Gift which won 1st place & the Frank Lloyd Wright Award. That is the red & white ribbons wrapped around a glass block done with a variety of stitches (described in January 2015 Needle Pointer’s Awards Gallery). She also got 2nd place and two Honorable Mentions. And, we had a nice talk with Deborah Wilson who was demonstrating her goldwork techniques that earned her 3 awards (1st place & the Eleanor Custis Lewis Award/Best in Show for a leaves/flowers design and two 2nd place of which one was a strawberry) in addition to the 1st place for a Christmas stocking for her son with his various hobbies stitched. My husband didn’t make the trip this year but he would have enjoyed seeing the large gold themed ottoman by Joan deGM (167). He elected not to make the 2-day trip once I added in the stop at Rehoboth Beach exhibit and knowing Linda, a fellow ANG Main Line Stitcher, agreed to make the trip with me. Linda thoroughly enjoyed her first trip to Woodlawn & I thoroughly enjoyed her company! We agree it is inspiring to see so many beautiful pieces under one roof!! She knows so many names of pieces & designers which is why I can really talk about more pieces this year. And, because we spent 4 hours, including a delicious lunch break, looking at everything and chatting with the docents! Linda liked a few designs on display that she sent questions to the stitchers. But, I found one she was interested in when I googled “needlepoint sampler patterns”. I looked in images & there it was – Northern Expressions Needlework’s Twisted Band Sampler, under multi-sampler category, done by Anna B (235) for which she won a 2nd place ribbon. It has diagonal patterns with a butterfly near the top and is done in various colors along the color wheel. The Queen’s Silhouette didn’t get a ribbon but I enjoy supporting the exhibit & will have to start on something for next year!! Perhaps it will be the canvas I picked up at In Stitches. It is from Dream House Ventures, Inc. (DH3825) and is called Swirling Leaves by a designer Linda Richardson under the name of Elements Fine Handpainted Needlepoint. A different designer from Dream House Ventures also designed the canvas Daisy (aka Sunflower) that I got 3rd place ribbon from Woodlawn a few years ago – maybe that’s a sign! 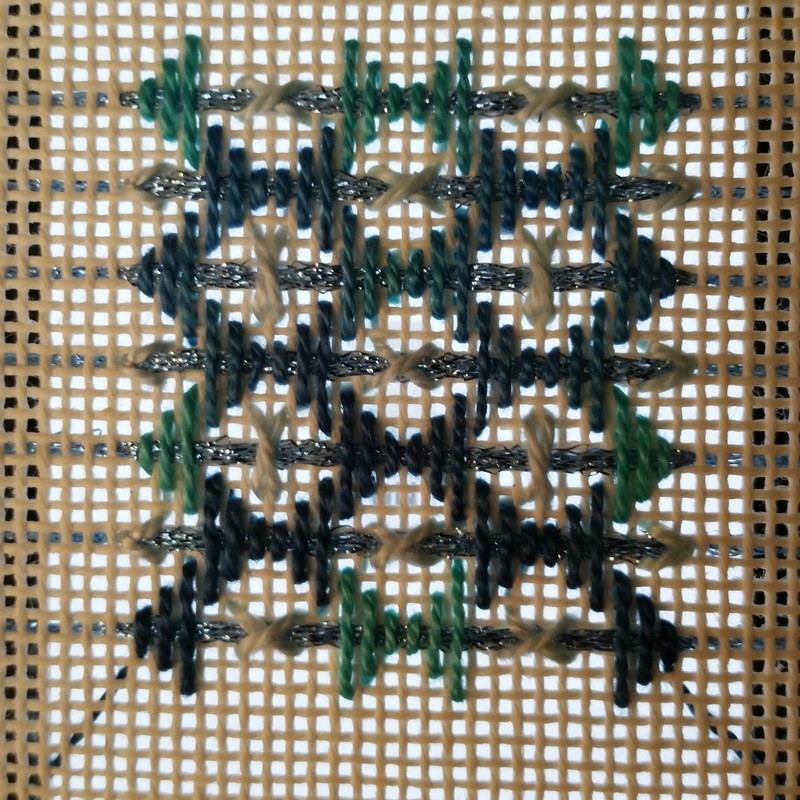 I was also taken by the one set of instructions for a geometric pattern, Teal-licious, by Freda’s Fancies. Apparently, there are at least 63 in the series and probably more!! How is it that I never saw these before? It’s time to search the internet again. Thanks to everyone who sent in pieces. It is such fun looking at 500 plus pieces under one roof. I wish I could talk about all of them but it’s time to move on to the Fifth Annual Rehoboth Beach Museum Needlework Exhibit which we saw on Sunday!! The third clue in the Stitching Games 2015 run by stitcherie is “Nigel”. Leonard Nimoy had just died & I thought of Nigel 7 right away believing it was from Star Trek. But, apparently not. I see it was mentioned in a Futurama episode. That still didn’t give me any ideas. So, I googled it, discovered it is the brightest star in the constellation Orion, & is a blue-bright supergiant. It appears that I am taking these clues literally because all I could think of was finding a stitch that looked like a star. I went through SuZy’s Portable Stitches by SuZy Murphy. 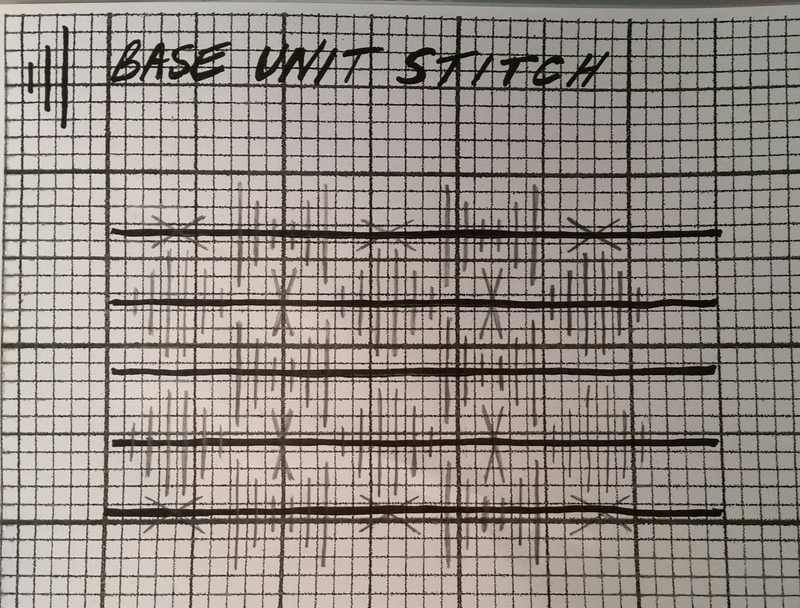 I love the app because it is set up by a list of stitches and by a list of uses. Under the category ‘Starry Skies’, I found the Combined Cross stitch. The thread I selected, Needle Necessities Inc (175), is an overdyed floss with purple that matches the vase & blue like the star, Nigel. They are randomly placed, like the stars, to not create a pattern or a streaky effect. My ANG Main Line Stitchers chapter is stitching various designs from Laura Perin’s Secret Garden Collage series for our spring project. I couldn’t decide between California Poppy, Daffodil, Daisy, and Pansy. So, I bought several & am starting with this one. 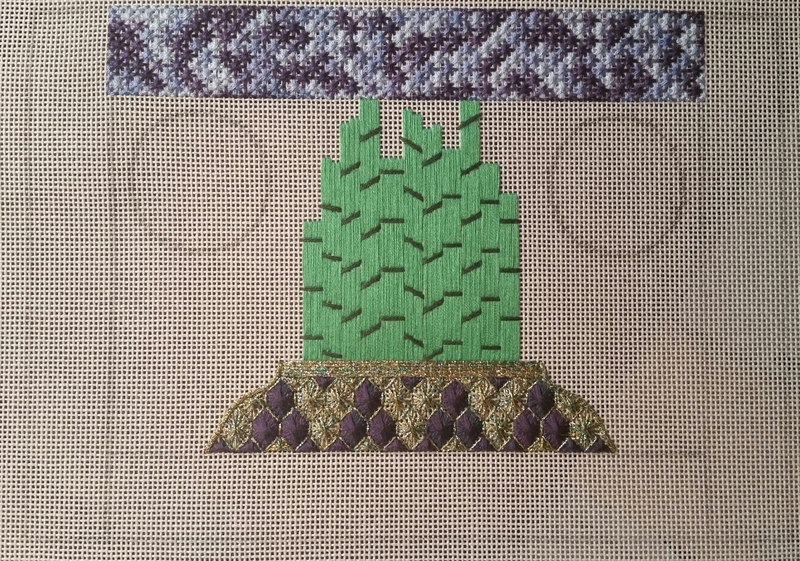 I had a harder time remembering to stop for the small squares on the outer border than all the counting required to get the smaller areas outlined correctly! But, it is correct. And, Area 1 is done! This is the best photo I could get because the colors of the boxes are dark blue & purple with a splash of green. We have been in a deep freeze (for Philly) & thinking about spring helps! I forgot to post this & since writing that, I made progress on the pansy. This section reminds me of cross-stitch days when I had to pencil off what I stitch as I stitch it. Slows me down but increases my accuracy. Spring is even closer now that daylight saving time is here!